London based multi-instrumentalist releaseshis second album. Louder Than War’s Paul Scott-Bates reviews. Drew Worthley is a strange thing, strange as in good. He makes music which sounds like 80s and 90s alternative pop, but somehow makes it sound new. It’s a curious thing and one which is hard to pin down with any success, thankfully. A young man with a penchant for complicated layers of sound and big words, he somehow makes the whole thing sound absolutely delightful. 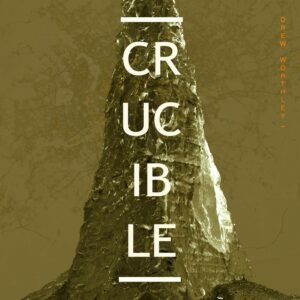 It’s one of the albums of the year without doubt, as its charm and downright insubordinate addictiveness shines through on each and every one of Crucible’s eleven tracks. Sometimes sounding like 80s darlings Japan, other times like Simon & Garfunkel, instances of Peter Gabriel and even Tom McRae, he intertwines his wonderfully intriguing lyrics with dramatic and melodious backings. Recent single, Bone China Saviour is nothing short of brilliant. It revisits the 80s pop extravaganza that made it the last real exciting musical era, and gently tucks in some thunderous if not clinical percussion amongst a minefield of enchanting wordplay and strong hooks. Not content with just singing or playing guitar, Worthley also contributes piano, synthesizers, banjo, trumpet and of course programming in an album which has an almost religious feel not helped by some of the imagery used on the fascinating sleeve artwork. Of course talk of walking on water and praying at the altar on A Cloud | A Hand | The Sea don’t help remove the notion, in fact there’s often the expectancy of a full Church cathedral appearing. It’s all dramatic stuff. Picking highlights is a difficult task. Certainly the mellow Flood Of Red is a contender and new single John Proctor’s Lament is as catchy as things get (spot a potential musical nod in the direction of the Human League), but it’s maybe the bits that aren’t particularly strong which hold the whole project together. Listening carefully, you’ll hear different sounds with each listen whether it be backing vocals, blips and bleeps or fascinating effects – it’s all there. Anybody that has the confidence to name tracks Derivative Calves or Entropic Heart certainly needs to be listened to, and on listening you’ll discovering some wondrous words and poetry. Penultimate track The Underground Man bounds along like a subway train and has dramatic drum patterns which sound magnificent at volume. In short, Crucible is a quite luscious album on many levels. Drew Worthley is clearly an exciting, talented and unique artist, and if this is the sort of quality he can produce on a difficult second album then there are potentially amazing times ahead. The Drew Worthley website is here: drewworthley.co.uk. He can be followed on Twitter as @drewworthley and liked on Facebook.